Who doesn’t love a good recipe? Therefore I’ve decided to occasionally share one of my favourite recipes, or recipes that come with an interesting story, on this blog. I’ll also try to post photos of the baking/cooking process and/or the final product. Awhile ago federal Agriculture Minister Gerry Ritz stopped by the Manitoba Rural Adaptation Council (MRAC) office where I work. He was in Winnipeg making an announcement and agreed to also meet with the chair and vice chair of the MRAC board of directors. (MRAC is funded by Agriculture and Agri-Food Canada). It just so happened that I had brought Banana Pineapple Muffins into the office that day to share with my co-workers. I enjoy baking and my co-workers are often the recipients of my treats – a perk of working with me! So my co-worker put a few of the muffins out on the boardroom table for our guests and Minister Ritz apparently had one. While I wasn’t in the room to witness him eating my muffin and the subsequent compliment, I was later told about it. And of course I was thrilled. So my co-workers have now dubbed these Ritz-approved muffins! Enjoy! Cream together butter and sugar. Add egg and beat well. Add other ingredients, blend well. Place batter in lined muffin tins. Bake at 350 F for 15 to 20 mins. Makes a dozen decent-sized muffins (like the ones pictured above). I think I am going to try this recipe. 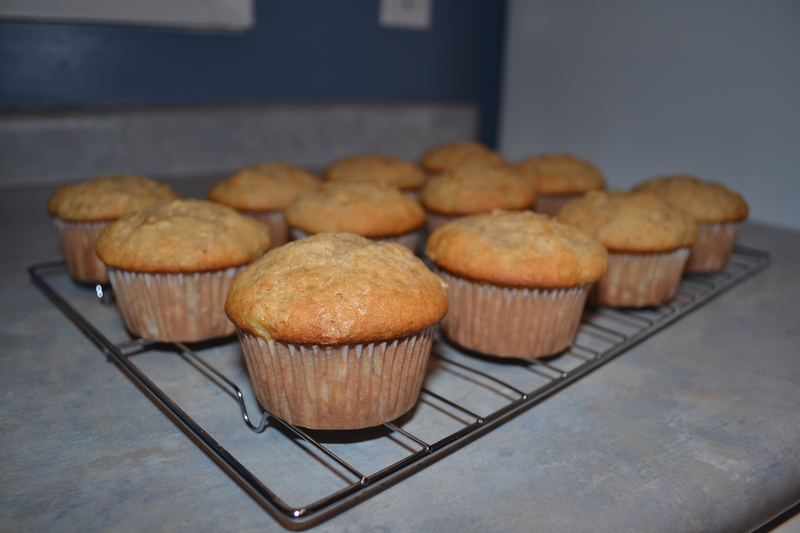 I have a few banana muffin recipes that I use, but haven’t quite found the one. My fave muffin recipe is a zucchini chocolate one. The fact that it calls for cloves sold me right away. More recipes should include cloves – my fave spice. Thanks for sharing, Karli! When you get a few minutes, send me your zucchini chocolate muffin recipe – I’d like to try it. When you said Ritz-approved, I was wondering if they used Ritz crackers at first LOL.